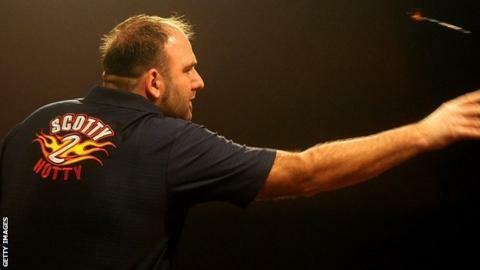 The 2013 champion Scott Waites was knocked out of the BDO World Championship at Lakeside by an outstanding second-round display from Scotland's Ross Montgomery. Montgomery, who posted a three-dart average of 97.30 and hit 12 of his 18 attempts at a double in a 4-0 win, will face three-time winner Martin Adams in the quarter-finals on Friday. Middlesbrough's Glen Durrant is also through, beating 10th seed Jamie Hughes 4-1. Elsewhere, defending women's champion Lisa Ashton whitewashed nine-time winner Trina Gulliver to reach the semi-finals. The 44-year-old from Bolton won all six legs of her match and ended with an average above 90. Ashton will play Sharon Prins of the Netherlands in the last four after she defeated Doncaster's Rachel Brooks 2-1. Montgomery's display was by far the most impressive of the tournament so far and the 52-year-old was visibly emotional after reaching the quarter-finals for the first time in eight visits to Frimley Green. Yorkshireman Waites, 37, could only manage three legs against Montgomery, who will now look to avenge his second-round defeat by Adams 12 months ago. He told BT Sport: "Martin did a job on me last year because I couldn't hit a double. "I'll enjoy tonight with my friends and I'll think about that game tomorrow." The men's quarter-final line-up is now complete, with all four ties scheduled for Friday.